Porcelain is a type of ceramic tile that is made of finer, denser clay. Since porcelain is denser than ceramic tile, it is also harder and less porous. This makes it very stain ad water resistant. Porcelain is available in several textures including: natural, smooth, polished, and textured surfaces. Porcelain tile is offered in glazed and un-glazed options; however, un-glazed tile requires more frequent cleaning. As a bonus, porcelain is much lighter than marble and granite – meaning easier installs. The versatility of porcelain is almost endless. Porcelain tile can be incorporated in several places of the home, including the kitchen, bathroom, and even fireplace. It has recently emerged into the bathroom design scene since it is low maintenance and can handle moisture and daily use. A great thing about porcelain is that it is available in several “looks.” It can even be made to look like metal, wood, and stone. Additionally, it can be used indoors and outdoors. With advancing technologies, porcelain is now available in larger segments. 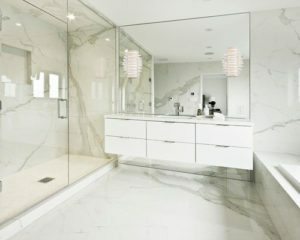 A recent trend in bathroom design is covering all of the walls with porcelain slab tiles. The large tiles can help to make the room appear larger due to the little number of grout lines. This creates a minimal look with little upkeep. Porcelain slab tile is a great option for those who want to create a glamorous look without the high costs since it is cheaper than marble. Although porcelain slab tile may be currently seen as a luxury item, it is expected to come down in costs as it becomes more popular. 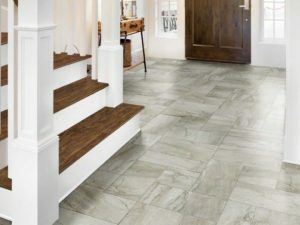 Porcelain is a great option for flooring, backsplashes, walls, and other accent areas in the home. It is a durable and stain resistant, which is a plus for any family. One of the major advantages of porcelain is that it is extremely versatile since it can be used in several areas of the home, as well as outdoor spaces. Porcelain tile is also available in many styles and can mimic the look of wood and metal. Wow, I never considered that porcelain tiles could be used on the walls as well! It looks so refined. Not only that, but I didn’t know it was cheaper than marble. I’m definitely going to consider this whenever I remodel my house.